Mumbai: A combination of factors such as a slowdown in bank lending, decline in non-banking financial companies’ (NBFCs’) cost of lending and an aggregate increase in demand was behind the spike in loans by NBFCs between December 2015 and March 2018, the Reserve Bank of India (RBI) said on Friday. In its report titled Trend and Progress of Banking in India, the central bank said that the statistically significant association between credit growth and liquidity conditions suggests that NBFCs operate a passive strategy to manage asset-liability mismatches (ALM) by covering gaps in the wholesale funding markets. This strategy, the RBI said, makes NBFCs vulnerable to liquidity risks. “The slowdown in scheduled commercial banks’ (SCBs) credit growth during the period of study provided a fillip to loan companies as substitution effects provided tailwinds. This was especially true of their lending to commercial real estate, consumer durables, and vehicle loans," it said. For this exercise, the RBI used supervisory data on 76 loan-giving NBFCs. The share of SCBs in loans to commercial real estate, for consumer durables, and vehicle loans, declined from 88.1% in December 2015 to 74.6% in March 2018, while the share of loan companies rose from 11.9% to 25.4% during the same period, the report said. “Besides liquidity conditions, aggregate demand is strongly associated with NBFCs’ lending, suggesting procyclicality and warranting counter-cyclical capital buffers," RBI said. The growth of loans and advances accelerated in 2017-18 and 2018-19 (up to September). Retail and the services sectors were the driving forces, but loan books also expanded because of credit to medium and large industries. The more active role of these entities in 2017-18 and 2018-19 (up to September), the RBI said, is attributable to improved credit demand as a result of a revival in manufacturing and service activity, coupled with robust consumption demand, and the tepid performance of equity markets. 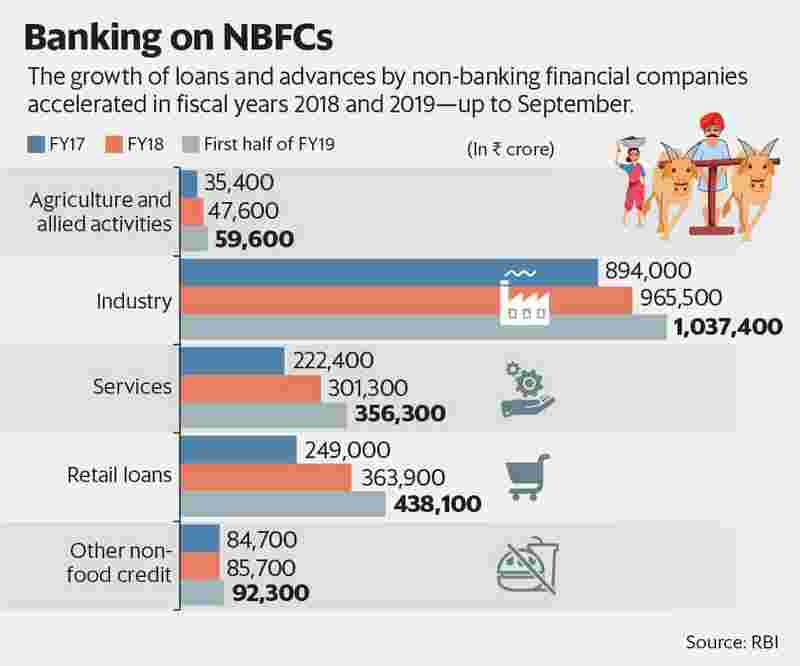 The report said that retail loans of NBFCs grew at 46.2% year-on-year (YoY) during 2017-18—on top of a growth of 21.6% YoY during 2016-17—reflecting upbeat consumer demand, especially in the vehicle loans segment. “Credit to the services sector was driven mainly by commercial real estate and retail trade. The growth in lending to commercial real estate is noteworthy in view of a sharp deceleration in SCBs’ credit to this sector," it said. NBFCs’ lending to the micro, small and medium enterprises (MSME) sector was also robust, compensating for the deceleration in SCBs’ credit, the central bank said. “Increasingly, NBFCs are looking for newer avenues to diversify their lending portfolios," the RBI said. The profitability of NBFCs improved during 2017-18 and 2018-19 (up to September) mainly because of an increase in fund-based income, the RBI pointed out. The report also said that NBFCs’ profitability indicators—return on equity (RoE) and return on assets (RoA)— were higher during 2017-18 than a year ago, though the net interest margin decreased, reflecting higher interest expenses. “Since November 2014, the asset classification norms of NBFCs have been incrementally aligned with those of banks, leading to higher NPA (non-performing asset) recognition," RBI said. However, during 2017-18, there has been an improvement in asset quality, with a part of the portfolio of assets classified as NPAs in 2016-17 being upgraded to standard assets. “As a result, both the gross non-performing assets (GNPAs) ratio and the net non-performing assets (NNPAs) ratio declined during 2017-18," it said.